With the illustration of a cycling figure on the cover and the opening pages talking about a bike race I first took this for a cycling book. But the more you get into the story, the more it becomes. There are early clues something is different. Within the first few pages you notice odd things. We have a the ordinary rider and his girlfriend but there’s another tone. Soon you notice the characters have odd names, they are Euro but not quite what you expect. Hans Banquo for example, where does he really come from? And the main character of the book, Romain Mariani sounds like he could be from Marseille in France but instead he’s from somewhere east of Eastern Europe, a grim place that’s beyond Bulgaria, and near Moldova and Transnistria. But the reality doesn’t matter as this is a novel. Indeed at times the book has a dreamlike feel, at times it was almost like reading a Kazuo Ishiguro novel. But before you get comfortable things turn to nightmare with violent descriptions of a bleak world and where the adjectives attack the reader like an angry dog. Most of my past book reviews have covered things we know already. I can relate the history of the Tour de France or describe a rider biography without spoiling too much. But a work of fiction is something else and so it is harder to discuss without giving the plot away. If this story is about a cyclist, it has more twists and turns than the ascent of Alpe d’Huez as crosses from sport into dark fantasy and horror. But at the same time all the excess only helps remind us how unreal pro cycling can be, for the wilder things become you can find yourself thinking “this isn’t too far from pro cycling”. The darker parts of the story – this isn’t a bedtime story for a child cyclist – hopefully stay in fiction but you can take the tale as an allegory for practices in the sport with coverage of money, the fears of a rider, the way teams work and above all, the hidden world of doping with its myths, whispers and more. I started the first few pages thinking “this isn’t quite how the sport goes” but soon understood that was the point. The reader is taken on a story that goes from pro cycling to something darker. If you’re going to write a cycling novel then the spartan life of a professional cyclist isn’t rich literary material, many ghost-written rider biographies prove this. Instead this is punchy novel that takes the reader away from familiar tales of training, racing and recovery and conjures up a wilder world. It’s an enjoyable read with a dark side. It’s been published by the author but you can find it as a paperback with Amazon or read it on the Kindle. You can also get a signed copy complete with a matching musette – handy for that trip to the butchers – direct from the author. 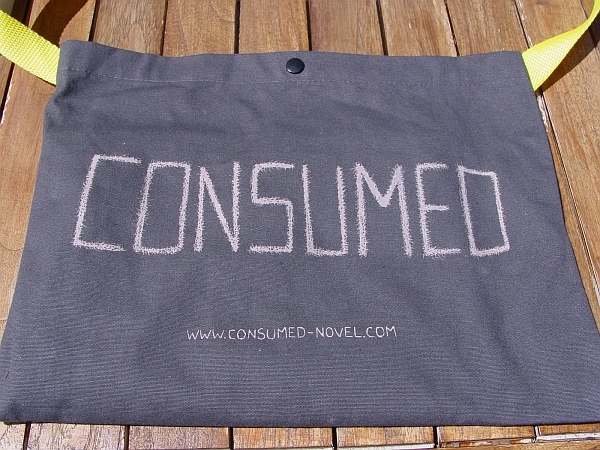 See consumed-novel.com for more. This book was sent in for review. A list of previous book reviews is available here. Sounds interesting and is reasonably priced, I will add it to my growing collection of cycling related literature. Thank you for the review. Amazon. Add to basket. Proceed to checkout. Pay. Click. Sounds intriguing – I’ve always thought cycling a good subject for a novel. Bravo for reviewing. If anyone has German try Thea Dorn’s ‘Maedchen Moerder’ (‘Girl Killer’). It’s about an ex-professional cyclist who kidnaps women, but the book has a twist – I won’t say anymore. Good psycho thriller which captures something of the flaws of the professional cyclist. Big seller in Germany. Anyone know any other cycling novels? Anything in French? Two Wheels is a “cycling murder mystery.” Fair to average reviews on Amazon.. The best cycling novel I’ve found still remains “The Rider” by Tim Krabbé – a fictionalized stream-of-consciousness tale of racing the Tour du Mont Aigoual in the Cévennes mountains of France. It might be more of a Proustian recollection of what goes through one’s mind during a race, rather than a conventionally plotted novel, but it’s great fiction nonetheless. I can re-read that book almost monthly, it’s so evocative. And I rode it last year, which I would highly recommend if you have the chance. A spectacular route. 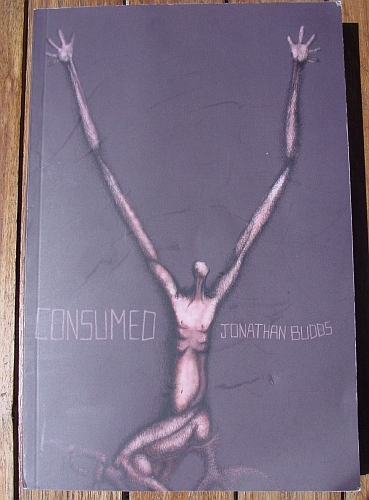 Just finished Consumed. A great read for anybody looking for a cycling inspired fiction with an extra dimension. Look forward to his next one. Big thanks for the review of this which prompted me to buy it. Just read the book on holiday and I’d also thoroughly recommend it. Very readable, very funny in places and read a bit like (early-mid) Brett Easton Ellis does a cycling novel (which is a compliment in my book and isn’t to suggest its derivative). Really enjoyed reading a cycling book that was immersed in the familiar but then did something very different with it. Seem to have had a mysterious inrng-generated name change there…don’t know why. This novel was a terrific read. The way bike- and procycling-related aspects mixed with paranormal notions fascinated me and always prevented me from guessing what’s next to happen. Also interesting is Mr. Jonathan Budds playing with the Reader’s sympathies to his protagonist, balancing on the line between admiring, pity and disgust. Many authors probably only would have been able to think of one side of this story and have blown it up to 300 pages +. Mr. Budds managed it just right. In terms of comparing the style in which Consumed was written with other known authors, I would rather see a ‘grimy’ Neil Gaiman than Easton Ellis. Anyway, Mr. Budds – thank you very much for this novel and Mr. inrng – thanks likewise for this truly valuable reading advice. hello Galli…that’s very kind of you to leave such thoughtful comments (plus, apart from a magistrate, no one’s ever called me Mr before…I like it!). Gaiman’s a writer I need to know more about – any recommendations, sling them my way…there’s a graphic novel of his (can’t remember the title) that looks fantastic ( I had half a thought to do ‘Consumed’ as a g.n. and wrote it with that style in mind). I had Cormac McCarthy to hand as well for the nasty, visceral stuff…only man for the job if anyone was ever going to write a fictionalised ‘Life of Lance’ ! Thanks again for taking the time to read & post.